Last weekend was my fake Facebook birthday so I took a trip to celebrate. Each year I forget my fake birthday until a couple days before I start receiving texts, and then I feel a little guilty. For obvious reasons I gave a fake ID to Facebook, not knowing that for years to come I’d be stealing fake birthday wishes from the community. I used to tell people “no, no, it’s only my fake Facebook birthday,” but I saw it robbed them of birthday joy so I learned to just say thank you. One of my Level 4 Tools is called the Present Dashboard. Part of the tool is looking out through your eyes at your life like you’re looking through the windshield of a car. This helps you be in the driver’s seat of your brain, giving you more choice on what you pay attention to, and how it makes you think and feel. You can imagine looking out through the windshield at a traffic-filled overcast day, or you can see the sun shining brightly on a road of your dreams. Your “real” day might seem hard, but looking through your windshield you might choose to experience it more joyfully. A challenging workout you might see like fun play. A tough meeting you might imagine going smoothly, and choose to brighten up and feel cheery no matter how it goes. 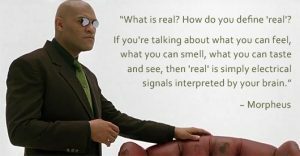 “What is real, Neo?” Morpheus asks in The Matrix. We’ve all seen the video of the basketball players and the person in the gorilla suit. We know that five different people observing a car accident will see it differently. What’s “real” to us is a product of our “filter patterns” that govern what we focus on, and our brain’s “rules” for processing this filtered information. Looking out from a beach in Thailand you can be reading the news and perceiving the world one way, or gazing out to sea smelling the salt and soaking up the person you’re with, experiencing reality rather differently. People are watching events on a small screen, having the experience of being at the big stadium. Video games, surfing online, much everything in our lives could be deemed “fake” until our brains make it real. Is this delusional? Is it kidding myself? Totally. A more fun delusion than kidding ourselves to only celebrate one day a year!